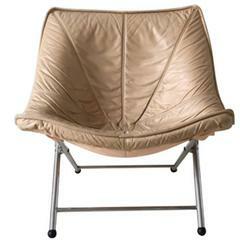 Lounge chair / Sling chair with a creamy white leather seating attached to canvas to a bentwood base. This piece remains in good condition but shows some wear, consistent with age and use (see:images). Sigurd Resell Norwegian interior and industrial designer was particularly active during the 1950s and ‘60s and is best known for his collaboration with Vatne Møbler, which resulted in the iconic Falcon chair. Born in 1920 in Meldal, Norway, Ressell studied carpentry at the Norwegian National Academy of Craft & Art Industry from 1943 until 1947. Sometime in the late 1940s or early 1950s, Ressell established his own studio, designing for various clients and manufacturers, including Niels Vodder. From 1948 to 1968, Ressell created interiors and furniture for Norwegian furniture brand Rastad & Relling. Notable designs include the 56/1 and 61/1 Chairs for the Bambi Series (1955), the Blinken Armchair (1956), and furniture for the expansion of the Norwegian Parliament (1950s). During the 1960s, Ressell began experimenting with steel, which he implemented in designs like his Circle Armchair (1960s). In 1965, in collaboration with designer Cato Mansrud, Resell designed the steel and canvas, safari-style Irafas Chair and Irafas Table for A. Grasaasen. The chair—which is safari spelled backwards—won second place at the Industry Council Chair Competition in 1965 and the Gold Medal at Ljubljana’s Biennial in 1966. In 1968, Resell became the chief designer for Norwegian furniture company Vatne, and his seminal Falcon Chair (1970) soon followed. 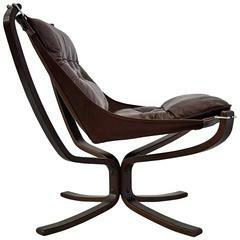 Originally named Blank Vals, the hammock-like chair was the result of a furniture competition for the Industry Council. 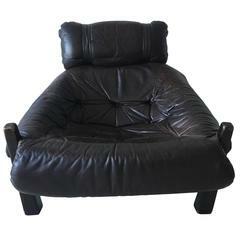 Vatne began production of the chair in 1971 under the new name. Within two years, Vatne’s sales tripled as Falcon Chairs sold worldwide, particularly in the United States, Japan, Germany, and Australia. Originally produced with a chrome frame, the chair was redesigned with a lighter laminated base in 1974 for easier distribution. Resell passed away in 2010. One pair of beige leather “Falcon” chairs. Wonderful 'Falcon' lounge chair by Sigurd Resell for Vatne Møbler, Norway, designed in 1971, with rosewood X-base and tuffed cognac colored leather supported by suspended canvas. Brown leather 'Falcon' chair by Sigurd Ressel for Vatne Mobler, Norway, 1960s. Original leather and frame with minimal patina. Tall back version with head cushion.